So as 2015 draws to a close, the Cadets and Staff took part in a final photoshoot for the year. Dressed in their smartest No 2 (Wedgewood) blue uniform the cadets stood ready before Officer in Charge, Flying Officer Rosie Chapman gave a final last minute order......to swap their blue berets for a more festive headgear! Attending the Wing Training Day and walking away with our head held high as worthy competitors and ones to watch for next year! 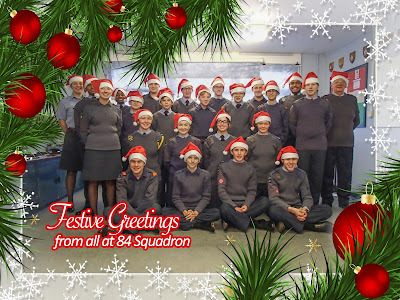 All this would not be possible without the constant support of staff and volunteers both at the Squadron, at Wing level and also out in the community so a huge THANK YOU goes to all those who made this year happen. Next year brings much of the same with a lot more on top! We will be celebrating the 75th Anniversary of the Air Training Corps as well as the 70th Anniversary of our own Squadron so watch this space about the many exciting things we have planned. On a personal a note, I would like to wish everyone a Merry Christmas, I hope you all have a good break from the busy lives we all lead and here's to a Happy New Year! P.S. First parade back for ALL Cadets is 6 January (Staff and NCO meeting on 3 Jan).